A friend and I have a new mission in life: to try out all the BBQ joints in New England, rate them, and some day write a book about our adventures. The writing a book part is really just a joke, but the adventures are real. 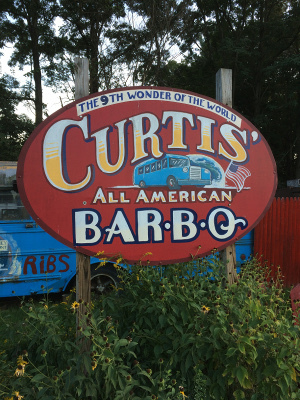 We drove out to Curtis' BBQ in Putney, Vermont. It was a very pleasant drive through southern NH to the border town of Putney. the BBQ joint is just off the road, next to a gas station near a few other buildings and establishments in town. There is a lot of outdoor seating, and a very lazy looking hog. The sides were amazing. I had a corn muffin, potato salad, and cole slaw (the slaw was really good). They were running brisket special, which I got. It was cubed (never had cubed brisket before) and I honestly couldn't tell if it had been smoked or not. If it had been, it must have been with a very mild wood. The meat was good (average for New England), and the sides were above average. On a return trip I'll have to check out the pork since thats one of the staples here. Worth a trip. The drive is lovely and the food is just as good as any other BBQ joint I've been in the north east.